We love a mix & match bridal party! 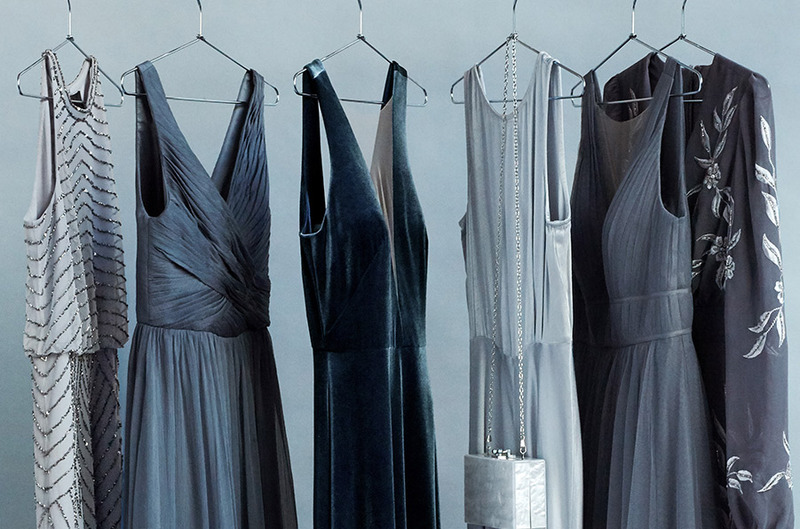 It gives each of your bridesmaids a chance to shine and—most importantly—feel comfortable. The key to mixing dresses is all about striking the right balance; our carefully curated color palettes make it easy to experiment with different shades, prints, and textures to create a gorgeous ensemble that feels effortless. Blush is our forever-favorite palette, but we love the added depth of complementary rosy hues, allover beading, and lace accents. Perfect for spring (and every season), it flatters all skin tones and pops against the natural greenery of an outdoor wedding. Taking cues from sea and sky, this palette is a modern spin on more traditional navy. Mixing in embroidered styles give your bridal party a boho vibe, while velvet and beaded styles will make them feel oh-so-luxe. We love this one for a rooftop soirée at dusk. Among all the dreamy pastel hues, soft greens caught our eye this season. Sparkly and printed styles lend just the right amount of sophistication alongside ethereal tulle and chiffon. Consider it for your beachside ceremony. An unconventional choice for the modern bride, ivory hues, beaded neutrals, and muted metallics evoke a boho-glam vibe. Choose dresses with a different texture than your gown so you still shine as the bride. True to its name, a neutral palette suits almost every venue and style of wedding. 1. Pick a base color and layer in different tones. Start with richer tones; make sure they look balanced next to each other. Layer in softer tones to even out the palette. 2. Incorporate a printed dress or two to tie multiple colors together. 3. Experiment with beading and embellishment to add texture. 4. Finally, add delicate jewels with a pop of color or sparkly sashes to balance the whole look. finding the perfect mix for your bridal party? 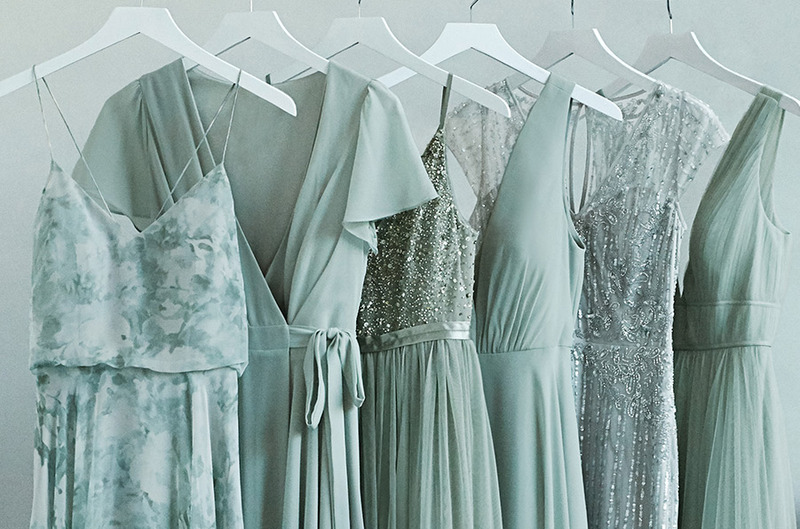 Mix and matching our favorite bridesmaids dresses is one of our favorite trends. However, it can be tricky when it comes to mixing floral bridesmaid dresses with different color bridesmaid dresses. 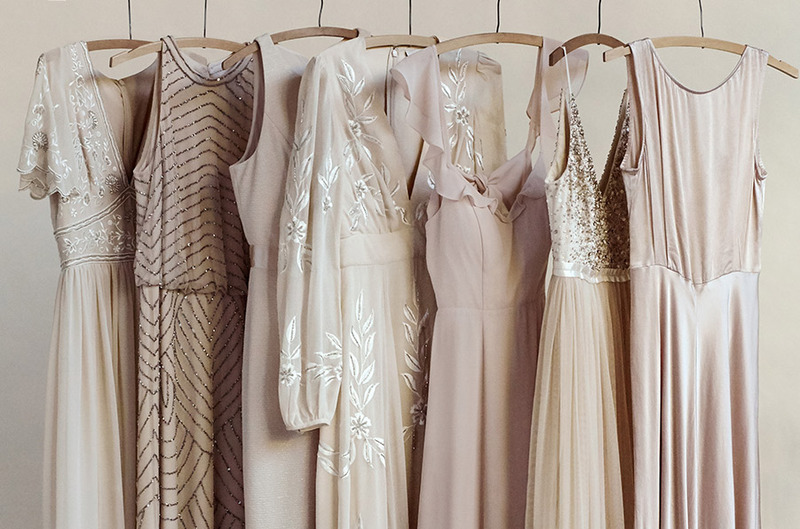 After talking to brides and their bridesmaids, we currated a few collections of bridesmaids dresses to show how to mix and match texture, patterns, and colors while still achieving a seamless look. 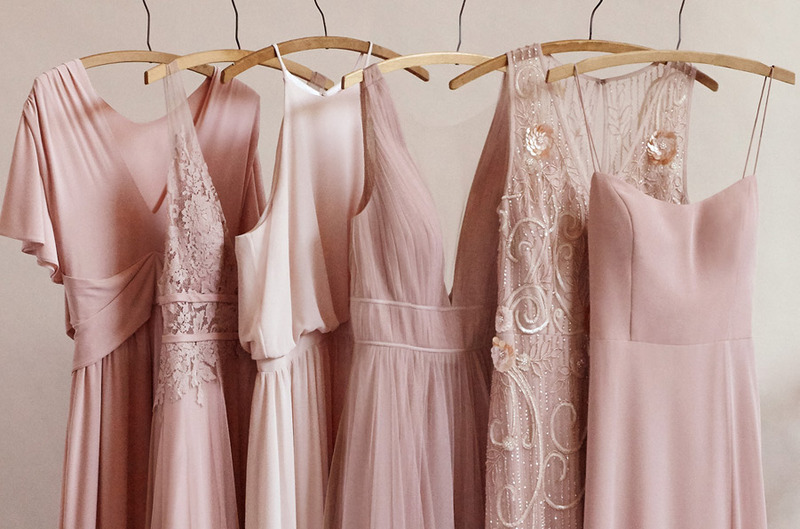 Keeping in mind some of your favorite colors, we put together a group of blush bridesmaid dresses that all have a different shape. This is for the bridesmaids who are looking to wear the same color, yet want a dress that looks best on their body type. Our second collection of dresses we sprinkled in a burgundy color to add on to the color story. Lastly, the third collection of unique bridesmaid dresses ties in florals, sequins, and different lengths for the ladies who want to go all out. If you need additional styling advice, reach out to our professional stylists!